Spring is here in the North of France. I might be speaking a bit prematurely, but the sun is out for the second day in a row, and the trees outside my open window are covered in rosy buds. It’s amazing how much something as simple as the weather can completely change my outlook on life. I’ve been pretty sick for the past few days, since I got back from Amsterdam. I managed to get bronchitis for the first time in my life, which, honestly, just amuses me at this point. My first visit to Amsterdam results in my becoming relatively ill and bedridden. Ah, the life of an assistant. Always thrillingly bizarre. 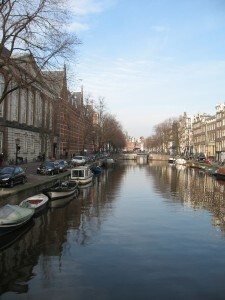 In any case, Amsterdam was awesome. After unsuccessfully searching for couchsurfing hosts for a few weeks (I only received a couple of responses to my multitude of requests, one of which apologetically declined because she would be busy hitchhiking to Paris that weekend…alrighty then), we decided to settle for the typical hostel experience, which was nice enough, as I actually hadn’t done it for a while. Rather than flying, we opted for the cheaper and, in this case, more efficient travel mode of taking the bus, which brought back loads of memories of taking the Greyhound from Tacoma to Pullman. Except, instead of journeying under a mountain-snagged sky, and a landscape full of sprawling evergreens, the scenery consisted of the never-ending green fields of Nord-Pas de Calais, small French towns, with brown-topped houses clustered around chapels, and, the tell-tale windmills of the Netherlands. These windmills, which I had only before seen on postcards, and in movies were monstrous. I don’t think I ever fully grasped how giant they are. Images of Don Quixote charging towards their spinning arms inevitably ran through my head, as we neared Amsterdam. Throughout our five day stay, we managed to explore the majority of the city’s famous quarters and monuments, including the Van Gogh museum (a dreams-come-true sort of moment), the beautiful Vondel Park, the Anne Frank house, and the Red Light District. We spent a good deal of our time just wandering through the streets, across canals, dodging the plethora of bicyclists, and, additionally, trams, cars, buses, and mopeds. Seriously. This city has a traffic lane for every possibly imaginable mode of transportation. For the entirety of my time there, we joked about the inevitability of death by collision. Funnily enough, I actually ran into a bicyclist at one point, as I was crossing a bridge late at night. Both of our reactions were to turn and shout, “Sorry!” a few times (a word, like “Yeah,” which is exactly the same in Dutch and English). Good times. After five days, it was time to head back home, and for me to head to the doctor (an incredibly frustrating, if not ridiculously absurd experience in a foreign country). I went to my appointment armed with a list of my symptoms, translated from English to French, all of my identification (including photocopies), and insurance information (both American and French). The doctor, my friend, and I ended up talking about the difference between the French, Scottish, and American medical care systems. Always fun to discuss politically-charged topics when you have a fever. Well, I’m off to wander a bit and soak up some Vitamin D.